We're pleased to offer our new Curl Protein Reconstructor + Deep Hydrating Hair Mask bundle! The Miracle RepaiRx Curl Protein Reconstructor works deep to restore protein in the hair, strengthening weak strands to prevent further damage and breakage. This gentle formula moisturizes the scalp, and smoothes the hair cuticle. Promotes hair growth and a healthy scalp. Free from parabens, sulfates, petrolatum, lanolin, artificial colors, or animal testing. 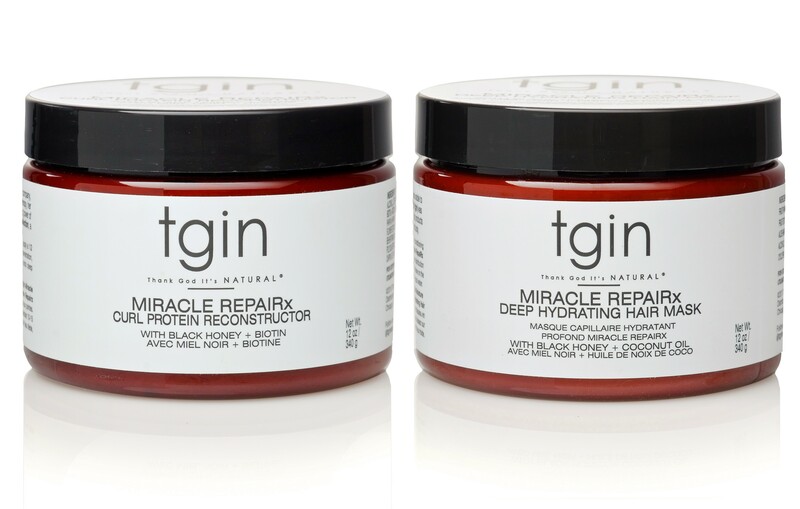 Intensely hydrating, the Miracle RepaiRx Deep Hydrating Hair Masque restores life to dry, damaged, or color treated hair with healing black honey and moisturizes with coconut oil, smoothing and softening the hair. Improves shine and manageability, locks in moisture and repairs damage, while reducing shedding and breakage. Restoring protein to your hair is essential to repairing damage and keeping your strands healthy. Following with a deep condition is just as important, and we've made it easy for you with our Buy One Get One set. This is the ultimate bundle to repair, restore, and revive your brittle, weak, or damaged curls! These two products make the perfect pair when used together! Ingredients for Deep Hydrating Hair Mask: Water, raw black honey, olea europaea (olive) fruit oil, agave americana leaf (agave) extract, carica papaya fruit (papaya) extract, ginger root (ginger) extract, gardenia tahitensis (monoi) flower extract, euterpe oleracea (acai) fruit extract, sclerocarya birrea (marula) seed oil, simmondsia chinensis (jojoba) seed oil, aloe barbadensis (aloe vera) leaf juice, cocos nucifera (coconut) oil, stearyl alcohol, cetyl alcohol, stearamidopropyl dimethylamine, glutamic acid, fragrance, benzyl alcohol, edita, cyclopentasiloxane. dimethicone, methylchloroisothiazolinone, methylisothiazolinone.